Examples of migrant species in both Americas. Olive green silhouettes denote North American species with South American ancestors; blue silhouettes denote South American species of North American origin. The Great American Interchange was an important late Cenozoic paleozoogeographic event in which land and freshwater fauna migrated from North America via Central America to South America and vice versa, as the volcanic Isthmus of Panama rose up from the sea floor and bridged the formerly separated continents. Although there were earlier dispersals, probably over water, the migration accelerated dramatically about 2.7 million years (Ma) ago during the Piacenzian age. It resulted in the joining of the Neotropic (roughly South America) and Nearctic (roughly North America) ecozones definitively to form the Americas. The interchange is visible from observation of both biostratigraphy and nature (neontology). Its most dramatic effect is on the zoogeography of mammals but it also gave an opportunity for reptiles, amphibians, arthropods, weak-flying or flightless birds, and even freshwater fish to migrate. The occurrence of the interchange was first discussed in 1876 by the "father of biogeography", Alfred Russel Wallace. Wallace had spent 1848–1852 exploring and collecting specimens in the Amazon basin. Others who made significant contributions to understanding the event in the century that followed include Florentino Ameghino, W. D. Matthew, W. B. Scott, Bryan Patterson, George Gaylord Simpson and S. David Webb. The Pliocene timing of the formation of the connection between North and South America was discussed in 1910 by Henry Fairfield Osborn. Analogous interchanges occurred earlier in the Cenozoic, when the formerly isolated land masses of India and Africa made contact with Eurasia c. 50 and 30 Ma ago, respectively. After the late Mesozoic breakup of Gondwana, South America spent most of the Cenozoic era as an island continent whose "splendid isolation" allowed its fauna to evolve into many forms found nowhere else on Earth, most of which are now extinct. Its endemic mammals initially consisted primarily of metatherians (marsupials and sparassodonts), xenarthrans, and a diverse group of native ungulates: notoungulates (the "southern ungulates"), litopterns, astrapotheres, pyrotheres and xenungulates. [n 1][n 2] A few non-therian mammals – monotremes, gondwanatheres, dryolestids and possibly cimolodont multituberculates – were also present in the Paleocene; while none of these diversified significantly and most lineages did not survive long, forms like Necrolestes and Patagonia remained as recently as the Miocene. Marsupials appear to have traveled via Gondwanan land connections from South America through Antarctica to Australia in the late Cretaceous or early Tertiary. [n 3] One living South American marsupial, the monito del monte, has been shown to be more closely related to Australian marsupials than to other South American marsupials; however, it is the most basal australidelphian,[n 4] meaning that this superorder arose in South America and then colonized Australia after the monito del monte split off. A 61-Ma-old platypus-like monotreme fossil from Patagonia may represent an Australian immigrant. Paleognath birds (ratites and South American tinamous) may have migrated by this route around the same time, more likely in the direction from South America to Australia/New Zealand. Other taxa that may have dispersed by the same route (if not by flying or floating across the ocean) are parrots, chelid turtles and (extinct) meiolaniid turtles. Marsupials present in South America included didelphimorphs (opossums) and several other small groups; larger predatory relatives of these also existed, like the borhyaenids and the sabertooth Thylacosmilus (sparassodont metatherians which are no longer considered to be true marsupials). After the extinction of sparassodonts, and before the arrival of carnivorans, giant opossums like Thylophorops represented true marsupial macropredators. Metatherians (and a few xenarthran armadillos like Macroeuphractus) were the only South American mammals to specialize as carnivores; their relative inefficiency created openings for nonmammalian predators to play more prominent roles than usual (similar to the situation in Australia). Sparassodonts and giant opossums shared the ecological niches for large predators with fearsome flightless "terror birds" (phorusrhacids), whose closest extant relatives are the seriemas. (Similar large terrestrial predatory birds, the bathornithids, were found in North America during the early Cenozoic, but they died out in the Early Miocene, about 20 million years ago.) Through the skies over late Miocene South America (6 Ma ago) soared the largest flying bird known, the teratorn Argentavis, with a wing span of 6 m or more, which may have subsisted in part on the leftovers of Thylacosmilus kills. Terrestrial ziphodont[n 5] sebecid (metasuchian) crocodyliforms were also present at least through the middle Miocene and maybe to the Miocene-Pliocene boundary. Some of South America's aquatic crocodilians, such as Gryposuchus, Mourasuchus and Purussaurus, reached monstrous sizes, with lengths up to 12 m (comparable to the largest Mesozoic crocodyliforms). They shared their habitat with one of the largest turtles of all time, the 3.3 m (11 ft) Stupendemys. Xenarthrans are a curious group of mammals that developed morphological adaptations for specialized diets very early in their history. In addition to those extant today (armadillos, anteaters and tree sloths), a great diversity of larger types were present, including pampatheres, the ankylosaur-like glyptodonts, predatory euphractines, various ground sloths, some of which reached the size of elephants (e.g. Megatherium), and even semiaquatic to aquatic marine sloths. The notoungulates and litopterns had many strange forms, like Macrauchenia, a camel-like litoptern with a small proboscis. They also produced a number of familiar-looking body types that represent examples of parallel or convergent evolution: one-toed Thoatherium had legs like those of a horse, Pachyrukhos resembled a rabbit, Homalodotherium was a semi-bipedal clawed browser like a chalicothere, and horned Trigodon looked like a rhino. Both groups started evolving in the Lower Paleocene, possibly from condylarth stock, diversified, dwindled before the great interchange, and went extinct at the end of the Pleistocene. The pyrotheres and astrapotheres were also strange but were less diverse and disappeared earlier, well before the interchange. The invasions of South America started about 40 Ma ago (middle Eocene), when caviomorph rodents arrived in South America. Their subsequent vigorous diversification displaced some of South America's small marsupials and gave rise to – among others – capybaras, chinchillas, viscachas, and New World porcupines. (The independent development of spines by New and Old World porcupines is another example of parallel evolution.) This invasion most likely came from Africa. The crossing from West Africa to the northeast corner of Brazil was much shorter then, due to continental drift, and may have been aided by island hopping (e.g. via St. Paul's Rocks, if they were an inhabitable island at the time) and westward oceanic currents. Crossings of the ocean were accomplished when at least one fertilised female (more commonly a group of animals) accidentally floated over on driftwood or mangrove rafts. (Island-hopping caviomorphs would subsequently colonize the West Indies as far as the Bahamas, reaching the Greater Antilles by the early Oligocene.) Over time, some caviomorph rodents evolved into larger forms that competed with some of the native South American ungulates, which may have contributed to the gradual loss of diversity suffered by the latter after the early Oligocene. By the Pliocene, some caviomorphs (e.g., Josephoartigasia) attained sizes on the order of 500 kg (1,100 lb) or larger. Later (by 36 Ma ago) primates followed, again from Africa in a fashion similar to that of the rodents. Primates capable of migrating had to be small. Like caviomorph rodents, South American monkeys are believed to be a clade (i.e., monophyletic). However, although they would have had little effective competition, all extant New World monkeys appear to derive from a radiation that occurred long afterwards, in the Early Miocene about 18 Ma ago. Subsequent to this, monkeys apparently most closely related to titis island-hopped to Cuba, Hispaniola and Jamaica. Additionally, a find of seven 21-Ma-old apparent cebid teeth in Panama suggests that South American monkeys had dispersed across the seaway separating Central and South America by that early date. However, all extant Central American monkeys are believed to be descended from much later migrants, and there is as yet no evidence that these early Central American cebids established an extensive or long-lasting population, perhaps due to a shortage of suitable rainforest habitat at the time. Many of South America's bats may have arrived from Africa during roughly the same period, possibly with the aid of intervening islands, although by flying rather than floating. Noctilionoid bats ancestral to those in the neotropical families Furipteridae, Mormoopidae, Noctilionidae, Phyllostomidae, and Thyropteridae are thought to have reached South America from Africa in the Eocene, possibly via Antarctica. Similarly, molossid bats may have reached South America from Africa in as many as five dispersals, starting in the Eocene. Emballonurid bats may have also reached South America from Africa about 30 Ma ago, based on molecular evidence. Vespertilionid bats may have arrived in five dispersals from North America and one from Africa. Natalid bats are thought to have arrived during the Pliocene from North America via the Caribbean. Tortoises also arrived in South America in the Oligocene. 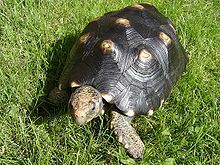 It was long thought that they had come from North America, but a recent comparative genetic analysis concludes that the South American genus Chelonoidis (formerly part of Geochelone) is actually most closely related to African hingeback tortoises. [n 7] Tortoises are aided in oceanic dispersal by their ability to float with their heads up, and to survive up to six months without food or water. South American tortoises then went on to colonize the West Indies and Galápagos Islands. A number of clades of American geckos seem to have rafted over from Africa during both the Paleogene and Neogene. Skinks of the related genera Mabuya and Trachylepis apparently dispersed across the Atlantic from Africa to South America and Fernando de Noronha, respectively, during the last 9 Ma. Surprisingly, South America's burrowing amphisbaenians and blind snakes also appear to have rafted from Africa, as does the hoatzin, a weak-flying bird of South American rainforests. The earliest traditionally recognized mammalian arrival from North America was a procyonid that island-hopped from Central America before the isthmus of Panama land bridge formed, around 7.3 Ma ago. This was South America's first eutherian carnivore. South American procyonids then diversified into forms now extinct (e.g. the "dog-coati" Cyonasua, which evolved into the bear-like Chapalmalania). However, all extant procyonid genera appear to have originated in North America. It has been suggested that the first South American procyonids may have contributed to the extinction of sebecid crocodilians by eating their eggs, but this view has not been universally viewed as plausible. [n 8] The procyonids were followed to South America by rafting/island-hopping hog-nosed skunks and sigmodontine rodents The oryzomyine tribe of sigmodontine rodents went on to colonize the Lesser Antilles up to Anguilla. One group has proposed that a number of large Neartic herbivores actually reached South America as early as 9–10 Ma ago, in the late Miocene, via the "Baudo pathway", an early land bridge that was probably incomplete and required some swimming and island-hopping to traverse. These claims, based on excavations in Amazonian Peru, have been viewed with caution by other investigators, due to the lack of corroborating finds from other sites. The limited evidence for these early immigrants may reflect their presence primarily in the Amazon basin, an area where fewer fossils have been collected. These taxa are: a proboscidean (Amahuacatherium),[n 9] peccaries (Sylvochoerus and Waldochoerus), tapirs and a palaeomerycid (from a family probably ancestral to cervids), Surameryx; the paleomerycids were probably unable to successfully colonize South America. Similarly, megalonychid and mylodontid ground sloths island-hopped to North America by 9 Ma ago. Megalonychids had colonized the Antilles previously, by the early Miocene. (Megatheriid and nothrotheriid ground sloths did not migrate north until the formation of the isthmus.) Terror birds may have also island-hopped to North America as early as 5 Ma ago. The formation of the Isthmus of Panama led to the last and most conspicuous wave, the great interchange, starting around 2.7 Ma ago. This included the immigration into South America of North American ungulates (including camelids, tapirs, deer and horses), proboscids (gomphotheres), carnivorans (including felids like cougars and saber-toothed cats, canids, mustelids, procyonids and bears) and a number of types of rodents[n 10]. The larger members of the reverse migration, besides ground sloths and terror birds, were glyptodonts, pampatheres, capybaras and the notoungulate Mixotoxodon (the only South American ungulate known to have invaded Central America). The southwardly migrating Nearctic carnivorans took over South American large terrestrial predator niches, displacing phorusrhacids and sparassodonts,[n 15] as well as eliminating Chapalmalania. It has been argued that canids probably played the major role in the extinction of sparassodonts; they are ecologically and morphologically more similar to most of them than other carnivorans, and are also the most diverse family of modern carnivorans on the continent. The paucity of early competition and plentiful prey seems to have allowed short-faced bears to rapidly evolve into the largest known bear or terrestrial mammalian carnivore species; Arctotherium angustidens is estimated to have weighed around 1600 kg. Later species of Arctotherium exhibited a trend towards smaller size and a more omnivorous diet, probably due to increasing competition from later-arriving or evolving carnivores. In contrast, Smilodon showed a trend toward increasing body size that culminated in the appearance of S. populator, at up to nearly 500 kg the most massive felid known. Due in large part to the continued success of the xenarthrans, one area of South American ecospace the Nearctic invaders were unable to dominate was the niches for megaherbivores. Before 12,000 years ago, South America was home to about 25 species of herbivores weighing more than 1000 kg, consisting of Neotropic ground sloths, glyptodonts and toxodontids, as well as gomphotheres and camelids of Nearctic origin. [n 16] Native South American forms made up about 75% of these species. However, none of these megaherbivores have survived. Armadillos, opossums and porcupines are present in North America today because of the Great American Interchange. Opossums and porcupines were among most successful northward migrants, reaching as far as Canada and Alaska, respectively. Most major groups of xenarthrans were present in North America up until the end-Pleistocene Quaternary extinction event (as a result of at least eight successful invasions of temperate North America, and at least six more invasions of Central America only). Among the megafauna, ground sloths were notably successful emigrants; four different lineages invaded North America. A megalonychid representative, Megalonyx, spread as far north as the Yukon and Alaska, and might well have invaded Eurasia had a suitable habitat corridor across Beringia been present. The effect of formation of the isthmus on the marine biota of the area was the inverse of its effect on terrestrial organisms, a development that has been termed the "Great American Schism". The connection between the east Pacific Ocean and the Caribbean (the Central American Seaway) was severed, setting now-separated populations on divergent evolutionary paths. Caribbean species also had to adapt to an environment of lower productivity after the inflow of nutrient-rich water of deep Pacific origin was blocked. The Pacific coast of South America cooled as the input of warm water from the Caribbean was cut off. This trend is thought to have caused the extinction of the marine sloths of the area. A north-south climatic asymmetry in the Americas. Tropical climate zones, which are warm year-round and moist at least part of the year (blue zones Af, Am and Aw), cover much of South America and nearly all of Central America, but very little of the rest of North America. The eventual triumph of the Nearctic migrants was ultimately based on geography, which played into the hands of the northern invaders in two crucial respects. The first was a matter of climate. Any species that reached Panama from either direction obviously had to be able to tolerate moist tropical conditions. Those migrating southward would then be able to occupy much of South America without encountering climates that were markedly different. However, northward migrants would have encountered drier and/or cooler conditions by the time they reached the vicinity of the Trans-Mexican Volcanic Belt. The challenge this climatic asymmetry (see map on right) presented was particularly acute for Neotropic species specialized for tropical rainforest environments, who had little prospect of penetrating beyond Central America. As a result, Central America currently has 41 mammal species of Neotropical origin,[n 20] compared to only 3 for temperate North America. However, species of South American origin (marsupials, xenarthrans, caviomorph rodents and monkeys) still comprise only 21% of species from nonflying, nonmarine mammal groups in Central America, while North American invaders constitute 49% of species from such groups in South America. Thus, climate alone cannot fully account for the greater success of species of Nearctic origin during the interchange. Land areas over which ancestors of Neotropic (green) and Nearctic (red) species could wander via two-way migrations during the latter part of the Cenozoic prior to the interchange. The smaller area available for Neotropic species to evolve in tended to put them at a competitive disadvantage. The second and more important advantage geography gave to the northerners is related to the land area available for their ancestors to evolve in. During the Cenozoic, North America was periodically connected to Eurasia via Beringia, allowing repeated migrations back and forth to unite the faunas of the two continents. [n 21] Eurasia was connected in turn to Africa, which contributed further to the species that made their way to North America. [n 22] South America, on the other hand, was connected only to Antarctica and Australia, two much smaller and less hospitable continents, and only in the early Cenozoic. Moreover, this land connection does not seem to have carried much traffic (apparently no mammals other than marsupials and perhaps a few monotremes ever migrated by this route), particularly in the direction of South America. This means that Northern Hemisphere species arose over a land area roughly six times greater than was available to South American species. North American species were thus products of a larger and more competitive arena,[n 23] where evolution would have proceeded more rapidly. They tended to be more efficient and brainier,[n 24][n 25] generally able to outrun and outwit their South American counterparts, who were products of an evolutionary backwater. These advantages can be clearly seen in the cases of ungulates and their predators, where South American forms were replaced wholesale by the invaders. The greater eventual success of South America's African immigrants compared to its native early Cenozoic mammal fauna is another example of this phenomenon, since the former evolved over a greater land area; their ancestors migrated from Eurasia to Africa, two significantly larger continents, before finding their way to South America. Against this backdrop, the ability of South America's xenarthrans to compete effectively against the northerners represents a special case. The explanation for the xenarthrans' success lies in part in their idiosyncratic approach to defending against predation, based on possession of body armor and/or formidable claws. The xenarthrans did not need to be fleet-footed or quick-witted to survive. Such a strategy may have been forced on them by their low metabolic rate (the lowest among the therians). Their low metabolic rate may in turn have been advantageous in allowing them to subsist on less abundant and/or less nutritious food sources. Unfortunately, the defensive adaptations of the large xenarthrans would have offered little protection against humans armed with spears and other projectiles. At the end of the Pleistocene epoch, about 12,000 years ago, three dramatic developments occurred in the Americas at roughly the same time (geologically speaking). Paleoindians invaded and occupied the New World, the last glacial period came to an end, and a large fraction of the megafauna of both North and South America went extinct. This wave of extinctions swept off the face of the Earth many of the successful participants of the Great American Interchange, as well as other species that had not migrated. All the pampatheres, glyptodonts, ground sloths, equids, proboscids, giant short-faced bears, dire wolves and machairodont species of both continents disappeared. The last of the South and Central American notoungulates and litopterns died out, as well as North America's giant beavers, lions, dholes, cheetahs, and many of its antilocaprid, bovid, cervid, tapirid and tayassuid ungulates. Some groups disappeared over most or all of their original range but survived in their adopted homes, e.g. South American tapirs, camelids and tremarctine bears (cougars and jaguars may have been temporarily reduced to South American refugia also). 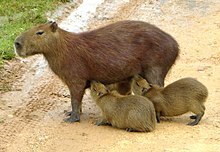 Others, such as capybaras, survived in their original range but died out in areas they had migrated to. Notably, this extinction pulse eliminated all Neotropic migrants to North America larger than about 15 kg (the size of a big porcupine), and all native South American mammals larger than about 65 kg (the size of a big capybara or giant anteater). In contrast, the largest surviving native North American mammal, the wood bison, can exceed 900 kg, and the largest surviving Nearctic migrant to South America, Baird's tapir, can reach 400 kg. ^ During the Eocene, astrapotheres and litopterns were also present in Antarctica. ^ Sequencing of collagen from fossils of one recently extinct species each of notoungulates and litopterns has indicated that these orders comprise a sister group to the perissodactyls. Mitochondrial DNA obtained from Macrauchenia corroborates this and gives an estimated divergence date of 66 Ma ago. ^ Once in Australia, facing less competition, marsupials diversified to fill a much larger array of niches than in South America, where they were largely carnivorous. ^ It is the sister group to a clade containing all other extant australidelphians (roughly 238 species). ^ Ziphodont (lateromedially compressed, recurved and serrated) teeth tend to arise in terrestrial crocodilians because, unlike their aquatic cousins, they are unable to dispatch their prey by simply holding them underwater and drowning them; they thus need cutting teeth with which to slice open their victims. ^ It is also notable that both simian primates (ancestral to monkeys) and hystricognath rodents (ancestral to caviomorphs) are believed to have arrived in Africa by rafting from Eurasia about 40 Ma ago. ^ North American gopher tortoises are most closely related to the Asian genus Manouria. ^ An alternative explanation blames climatic and physiographic changes associated with the uplift of the Andes. ^ The status of Amahuacatherium is controversial, and it is sometimes considered as a misinterpreted fossil of a Pleistocene gomphothere. ^ In this connection, however, it is interesting to note that chalicotheres, clawed perissodactyl herbivores ecologically similar to ground sloths, died out in North America in the Miocene about 9 Ma ago, while they survived to the early Pleistocene in Asia and Africa. ^ The more dog-like sparassodonts, borhyaenids and similar types, were already in decline before the main pulse of the interchange, at a time when Thylacosmilus and phorusrhacids were still common. Suggested reasons for this decline include competition with phorusrhacids, carnivorous opossums, or early-arriving procyonids. However, it is clear that the remaining sparassodonts and most of the phorusrhacids (Titanis and the much smaller Psilopterus being exceptions) disappeared quickly once canids and felids reached South America. ^ P. S. Martin (2005), pp. 30–37, 119. The figure of 25 South American megaherbivore species breaks down as follows: 4 gomphotheres, 2 camelids, 9 ground sloths, 5 glyptodonts, and 5 toxodontids. This can be compared to Africa's present and recent total of 6 megaherbivores: 1 giraffe, 1 hippo, 2 rhinos and 2 elephants (considering the African forest elephant as a separate species). ^ Including extinct genera, South America has hosted 9 genera of cervids, 8 genera of mustelids, and 10 genera of canids. However, some of this diversity of South American forms apparently arose in North or Central America prior to the interchange. There is significant disagreement in the literature concerning how much of the diversification of South America's canids occurred prior to the invasions. A number of studies concur that the grouping of endemic South American canids (excluding Urocyon and Canis, although sometimes transferring C. gezi to the South American group) is a clade. However, different authors conclude that members of this clade reached South America in at least two, three to four, or six invasions from North America. ^ Canis, e.g. Canis dirus, was present in South America until the end of the Pleistocene. ^ During the Miocene alone, between about 23 and 5 Ma ago, 11 episodes of invasions of North America from Eurasia have been recognized, bringing a total of 81 new genera into North America. ^ The combination of Africa, Eurasia and North America was termed the "World Continent" by George Gaylord Simpson. ^ According to data on the EQ (encephalization quotient, a measure of the brain to body size ratio adjusted for the expected effect of differences in body size) of fossil ungulates compiled by H. Jerison, North American ungulates showed a trend towards greater EQs going from the Paleogene to the Neogene periods (average EQs of 0.43 and 0.64, respectively), while the EQs of South American ungulates were static over the same time interval (average EQ unchanged at 0.48). This analysis was later criticized. Jerison subsequently presented data suggesting that native South American ungulates also lagged in the relative size of their neocortex (a measurement not subject to the vagaries of body mass estimation). It is interesting to note that the late survivor Toxodon had one of the highest EQ values (0.88) among native Neotropic ungulates. Jerison also found that Neogene xenarthrans had low EQs, similar to those he obtained for South American ungulates. ^ The estimated EQ of Thylacosmilus atrox, 0.41 (based on a brain mass of 43.2 g, a body mass of 26.4 kg, and an EQ of 43.2/[0.12*26400^(2/3)]), is high for a sparassodont, but is lower than that of modern felids, with a mean value of 0.87. Estimates of 0.38 and 0.59 have been given for the EQ of much larger Smilodon fatalis (based on body mass estimates of 330 and 175 kg, respectively). ^ The giant tortoises of Asia and Africa died out much earlier in the Quaternary than those of South America, Madagascar and Australia, while those of North America died out around the same time. ^ P. S. Martin (2005), p. 175. ^ A number of recently extinct North American (and in some cases also South American) taxa such as tapirs, equids, camelids, saiga antelope, proboscids, dholes and lions survived in the Old World, probably mostly for different reasons – tapirs being a likely exception, since their Old World representative survived only in the rainforests of Southeast Asia. (Cheetahs in the broadest sense could be added to this list, although the New and Old World forms are in different genera.) Old World herbivores may in many cases have been able to learn to be vigilant about the presence of humans during a more gradual appearance (by development or migration) of advanced human hunters in their ranges. In the cases of predators, the Old World representatives in at least some locations would thus have suffered less from extinctions of their prey species. In contrast, the musk ox represents a rare example of a megafaunal taxon that recently became extinct in Asia but survived in remote areas of arctic North America (its more southerly-distributed relatives such as Harlan's musk ox and the shrub ox were less fortunate). ^ a b c This listing currently has fairly complete coverage of mammals, but only spotty coverage of other groups. Crossings by nonflying mammals and birds occurred during the last 10 Ma. Crossings by fish, arthropods, rafting amphibians and reptiles, and flying bats and birds were made before 10 Ma ago in many cases. Taxa listed as invasive did not necessarily cross the isthmus themselves; they may have evolved in the adopted land mass from ancestral taxa that made the crossing. ^ While all megalonychid ground sloths are extinct, extant two-toed tree sloths are from the same family. Three-toed tree sloths, in contrast, are not closely related to any of the groups of extinct ground sloths. ^ Mixotoxodon remains have been collected in Central America and Mexico as far north as Veracruz and Michoacán, with a possible find in Tamaulipas; additionally, one fossil tooth has been identified in eastern Texas, United States. ^ For the purposes of this article, all northwardly migrating Neotropic taxa that failed to reach the territory of the continental U.S. will be treated as having only reached Central America. While Central America is usually defined physiographically as ending at the Isthmus of Tehuantepec, or less commonly, at the Trans-Mexican Volcanic Belt, most of the taxa that proceeded further but failed to reach the present Mexican border are or were confined to tropical or subtropical ecozones similar to those of Central America. Examples include the giant anteater, the grayish mouse opossum, the lowland paca and Geoffroy's spider monkey. ^ Fossils of the giant anteater have been found as far north as northwestern Sonora, Mexico. ^ It has been proposed that monkeys invaded Central America in at least three and probably four waves, as follows: (1) an initial invasion by A. pigra and S. oerstedii ~ 3 Ma ago; (2) an invasion by A. palliata (giving rise to A. coibensis), A. geoffroyi and C. capucinus ~ 2 Ma ago; an invasion by A. zonalis and S. geoffroyi ~ 1 Ma ago; a most recent invasion by A. fusciceps. The species of the first wave have apparently been out-competed by those of the second, and now have much more restricted distributions. ^ Salamanders apparently dispersed to South America by the Early Miocene, about 23 Ma ago. Nevertheless, the salamander fauna of South America, which is restricted to the tropical region, consists of only 2 clades, and has fewer species and is far less diverse than that of much smaller Central America. Salamanders are believed to have originated in northern Pangea, perhaps not long before it separated to become Laurasia, and are not present anywhere else in the Southern Hemisphere (see the world salamander distribution map). In contrast, caecilians have a mostly Gondwanan distribution. Apart from a small region of overlap in southern China and northern Southeast Asia, Central America and northern South America are the only places in the world where both salamanders and caecilians are present. ^ This is based on the definition of Sigmodontinae that excludes Neotominae and Tylomyinae. ^ Hippidion, a relatively short-legged equid that developed in South America after invading from North America about 2.5 Ma ago, has traditionally been thought to have evolved from pliohippines. However, recent studies of the DNA of Hippidion and other New World Pleistocene horses indicate that Hippidion is actually a member of Equus, closely related to the extant horse, E. ferus. Another invasion of South America by Equus occurred about one Ma ago, and this lineage, traditionally viewed as the subgenus Equus (Amerhippus), appears indistinguishable from E. ferus. Both these lineages became extinct at the end of the Pleistocene, but E. ferus was reintroduced from Eurasia by Europeans in the 16th century. Note: the authors of the DNA sequence study of Equus (Amerhippus) use "E. caballus" as an alternative specific name for "E. ferus". ^ Not to be confused with the American mastodon (Mammut americanum), a proboscid from a different family whose remains have been found no further south than Honduras. ^ Sometimes classified as elephantids rather than as gomphotheres. ^ Not to be confused with the South American gray fox. ^ Condors apparently reached South America by the late Miocene or early Pliocene (4.5 – 6.0 Ma ago), several million years before the formation of the isthmus. Condor-like forms in North America date back to the Barstovian stage (middle Miocene, 11.8 – 15.5 Ma ago). ^ The native South American ungulates dwindled gradually as North American ungulates invaded and diversified. The changes in number and composition of South America's ungulate genera over time are given in the table below. The Quaternary extinction event that delivered the coup de grâce to the native Neotropic ungulates also dealt a heavy blow to South America's ungulate immigrants. ^ O'Dea, A.; Lessios, H. A.; Coates, A. G.; et al. (2016). "Formation of the Isthmus of Panama". Science Advances. 2 (8): e1600883. doi:10.1126/sciadv.1600883. PMC 4988774. PMID 27540590. ^ Wallace, Alfred Russel (1876). The Geographical Distribution of Animals. With a Study of the Relations of Living and Extinct Faunas as Elucidating the Past Changes of the Earth's Surface. 1. New York: Harper and Brothers. OCLC 556393. ^ Wallace, Alfred Russel (1876). Ibid.. 2. New York: Harper and Brothers. OCLC 556393. ^ a b Marshall, L. G. (July–August 1988). "Land Mammals and the Great American Interchange" (PDF). American Scientist. 76 (4): 380–388. Archived (PDF) from the original on 2013-03-02. Retrieved 2014-04-22. ^ Osborn, H. (1910). The Age Of Mammals In Europe, Asia, And North America. New York, EEUU: The Macmillan Company. ^ Karanth, K. Praveen (2006-03-25). "Out-of-India Gondwanan origin of some tropical Asian biota" (PDF). Current Science. 90 (6): 789–792. Retrieved 2008-12-29. ^ Hedges, S. Blair (2001-01-02). "Afrotheria: Plate tectonics meets genomics". Proceedings of the National Academy of Sciences. 98 (1): 1–2. doi:10.1073/pnas.98.1.1. PMC 33345. PMID 11136239. ^ a b c Simpson, George Gaylord (1980). Splendid Isolation: The Curious History of South American Mammals. New Haven: Yale University Press. ISBN 978-0-300-02434-0. OCLC 5219346. ^ Bond, M.; Kramarz, A.; MacPhee, R. D. E.; Reguero, M. (2011). "A new astrapothere (Mammalia, Meridiungulata) from La Meseta Formation, Seymour (Marambio) Island, and a reassessment of previous records of Antarctic astrapotheres" (PDF). American Museum Novitates. 3718 (3718): 1–16. doi:10.1206/3718.2. ^ M. Bond; M. A. Reguero; S. F. Vizcaíno; S. A. Marenssi (2006). "A new 'South American ungulate' (Mammalia: Litopterna) from the Eocene of the Antarctic Peninsula". In J. E. Francis; D. Pirrie; J. A. Crame. Cretaceous-tertiary high-latitude palaeoenvironments: James Ross Basin, Antarctica. Geological Society, London, Special Publications. 258. The Geological Society of London. pp. 163–176. Bibcode:2006GSLSP.258..163B. doi:10.1144/GSL.SP.2006.258.01.12. ^ Gelfo, J. N.; Mörs, T.; Lorente, M.; López, G. M.; Reguero, M.; O'Regan, H. (2014-07-16). "The oldest mammals from Antarctica, early Eocene of the La Meseta Formation, Seymour Island". Palaeontology. 58 (1): 101–110. doi:10.1111/pala.12121. ^ Welker, F.; Collins, M. J.; Thomas, J. A.; Wadsley, M.; Brace, S.; Cappellini, E.; Turvey, S. T.; Reguero, M.; Gelfo, J. N.; Kramarz, A.; Burger, J.; Thomas-Oates, J.; Ashford, D. A.; Ashton, P. D.; Rowsell, K.; Porter, D. M.; Kessler, B.; Fischer, R.; Baessmann, C.; Kaspar, S.; Olsen, J. V.; Kiley, P.; Elliott, J. A.; Kelstrup, C. D.; Mullin, V.; Hofreiter, M.; Willerslev, E.; Hublin, J.-J. ; Orlando, L.; Barnes, I.; MacPhee, R. D. E. (2015-03-18). "Ancient proteins resolve the evolutionary history of Darwin's South American ungulates". Nature. 522 (7554): 81–84. Bibcode:2015Natur.522...81W. doi:10.1038/nature14249. ISSN 0028-0836. PMID 25799987. ^ Buckley, M. (2015-04-01). "Ancient collagen reveals evolutionary history of the endemic South American 'ungulates'". Proceedings of the Royal Society B: Biological Sciences. 282 (1806): 20142671. doi:10.1098/rspb.2014.2671. PMC 4426609. PMID 25833851. ^ Westbury, M.; Baleka, S.; Barlow, A.; Hartmann, S.; Paijmans, J. L. A.; Kramarz, A.; Forasiepi, A. M.; Bond, M.; Gelfo, J. N.; Reguero, M. A.; López-Mendoza, P.; Taglioretti, M.; Scaglia, F.; Rinderknecht, A.; Jones, W.; Mena, F.; Billet, G.; de Muizon, C.; Aguilar, J. L.; MacPhee, R. D. E.; Hofreiter, M. (2017-06-27). "A mitogenomic timetree for Darwin's enigmatic South American mammal Macrauchenia patachonica". Nature Communications. 8: 15951. Bibcode:2017NatCo...815951W. doi:10.1038/ncomms15951. PMC 5490259. PMID 28654082. ^ Chimento, Nicolás R.; Agnolin, Federico L.; Novas, Fernando E. (2015). "The bizarre 'metatherians' Groeberia and Patagonia, late surviving members of gondwanatherian mammals". Historical Biology: An International Journal of Paleobiology. 27 (5): 603–623. doi:10.1080/08912963.2014.903945. ^ a b Nilsson, M. A.; Churakov, G.; Sommer, M.; Van Tran, N.; Zemann, A.; Brosius, J.; Schmitz, J. (2010-07-27). "Tracking Marsupial Evolution Using Archaic Genomic Retroposon Insertions". PLoS Biology. 8 (7): e1000436. doi:10.1371/journal.pbio.1000436. PMC 2910653. PMID 20668664. ^ Briggs, J. C. (August 2003). "Fishes and Birds: Gondwana Life Rafts Reconsidered". Syst. Biol. 52 (4): 548–553. doi:10.1080/10635150390218385. JSTOR 3651142. PMID 12857645. ^ Naish, Darren (29 June 2008). "Invasion of the marsupial weasels, dogs, cats and bears... or is it?". scienceblogs.com. Retrieved 2008-12-07. ^ Naish, Darren (2006-10-27). "Terror birds". darrennaish.blogspot.com. Retrieved 2008-03-29. ^ Alvarenga, H. M. F.; Höfling, E. (2003). "Systematic Revision of the Phorusrhacidae (Aves: Ralliformes)". Papéis Avulsos de Zoologia. 43 (4): 55–91. doi:10.1590/S0031-10492003000400001. ^ Palmqvist, Paul; Vizcaíno, Sergio F. (2003-09-30). "Ecological and reproductive constraints of body size in the gigantic Argentavis magnificens (Aves, Theratornithidae) from the Miocene of Argentina" (PDF). Ameghiniana. 40 (3): 379–385. Retrieved 2008-12-11. ^ Paolillo, A.; Linares, O. J. (2007-06-05). "Nuevos Cocodrilos Sebecosuchia del Cenozoico Suramericano (Mesosuchia: Crocodylia)" (PDF). Paleobiologia Neotropical. 3: 1–25. Retrieved 2008-09-28. ^ Busbey, Arthur B. III (1986-03-07). "New Material of Sebecus cf. huilensis (Crocodilia: Sebecosuchidae) from the Miocene La Venta Formation of Colombia". Journal of Vertebrate Paleontology. 6 (1): 20–27. doi:10.1080/02724634.1986.10011595. JSTOR 4523070. ^ Salas-Gismondi, R.; et al. (2007). "Middle Miocene Crocodiles From the Fitzcarrald Arch, Amazonian Peru" (PDF). In Díaz-Martínez, E.; Rábano, I. 4th European Meeting on the Palaeontology and Stratigraphy of Latin America. Madrid: Instituto Geológico y Minero de España. pp. 355–360. ISBN 978-84-7840-707-1. ^ a b c Gasparini, Zulma (September 1984). "New Tertiary Sebecosuchia (Crocodylia: Mesosuchia) from Argentina". Journal of Vertebrate Paleontology. 4 (1): 85–95. doi:10.1080/02724634.1984.10011988. JSTOR 4522967. ^ Liccardo, A.; Weinschütz, L. C. (September 2010). "Registro inédito de fósseis de vertebrados na Bacia Sedimentar de Curitiba (PR)". Revista Brasileira de Geociências (in Portuguese). 40 (3): 330–338. doi:10.25249/0375-7536.2010403330338. Retrieved 2017-10-23. ^ Möller-Krull, Maren; Delsuc, Frédéric; Churakov, Gennady; Marker, Claudia; Superina, Mariella; Brosius, Jürgen; Douzery, Emmanuel J. P.; Schmitz, Jürgen (2007-09-17). "Retroposed Elements and Their Flanking Regions Resolve the Evolutionary History of Xenarthran Mammals (Armadillos, Anteaters, and Sloths)". Molecular Biology and Evolution. 24 (11): 2573–2582. doi:10.1093/molbev/msm201. PMID 17884827. ^ Muizon, C. de; McDonald, H. G.; Salas, R.; Urbina, M. (June 2004). "The evolution of feeding adaptations of the aquatic sloth Thalassocnus". Journal of Vertebrate Paleontology. 24 (2): 398–410. doi:10.1671/2429b. JSTOR 4524727. ^ Amson, E.; Muizon, C. de; Laurin, M.; Argot, C.; Buffrénil, V. de (2014). "Gradual adaptation of bone structure to aquatic lifestyle in extinct sloths from Peru". Proceedings of the Royal Society B: Biological Sciences. 281 (1782): 20140192. doi:10.1098/rspb.2014.0192. PMC 3973278. PMID 24621950. ^ a b c Poux, C.; Chevret, P.; Huchon, D.; De Jong, W. W.; Douzery, E. J. P. (2006). "Arrival and Diversification of Caviomorph Rodents and Platyrrhine Primates in South America" (PDF). Systematic Biology. 55 (2): 228–244. doi:10.1080/10635150500481390. PMID 16551580. Retrieved 2011-10-25. ^ Mangels, J. (2011-10-15). "Case Western Reserve University expert uses fossil teeth to recast history of rodent". Cleveland Live, Inc. Retrieved 2011-10-25. ^ Antoine, P.-O. ; Marivaux, L.; Croft, D. A.; Billet, G.; Ganerod, M.; Jaramillo, C.; Martin, T.; Orliac, M. J.; et al. (2011). "Middle Eocene rodents from Peruvian Amazonia reveal the pattern and timing of caviomorph origins and biogeography". Proceedings of the Royal Society B: Biological Sciences. 279 (1732): 1319–1326. doi:10.1098/rspb.2011.1732. PMC 3282368. PMID 21993503. ^ Flynn, J. J.; Wyss, A. R. (1998). "Recent advances in South American mammalian paleontology". Trends in Ecology and Evolution. 13 (11): 449–454. doi:10.1016/S0169-5347(98)01457-8. PMID 21238387. ^ Flynn, John J.; Wyss, André R.; Charrier, Reynaldo (2007). "South America's Missing Mammals". Scientific American. 296 (May): 68–75. Bibcode:2007SciAm.296e..68F. doi:10.1038/scientificamerican0507-68. ^ Fratantoni, D. M.; Johns, W. E.; Townsend, T. L.; Hurlburt, H. E. (August 2000). "Low-Latitude Circulation and Mass Transport Pathways in a Model of the Tropical Atlantic Ocean". Journal of Physical Oceanography. 30 (8): 1944–1966. doi:10.1175/1520-0485(2000)030<1944:LLCAMT>2.0.CO;2. ^ a b Hedges, S. Blair (November 1996). "Historical biogeography of West Indian vertebrates". Annual Review of Ecology and Systematics. 27 (1): 163–196. doi:10.1146/annurev.ecolsys.27.1.163. ^ a b Hedges, S. Blair (2006-08-23). "Paleogrography of the Antilles and Origin of West Indian Terrestrial Vertebrates". Annals of the Missouri Botanical Garden. 93 (2): 231–244. doi:10.3417/0026-6493(2006)93[231:POTAAO]2.0.CO;2. ^ Vélez-Juarbe, J.; Martin, T.; Macphee, R. D. E.; Ortega-Ariza, D. (January 2014). "The earliest Caribbean rodents: Oligocene caviomorphs from Puerto Rico". Journal of Vertebrate Paleontology. 34 (1): 157–163. doi:10.1080/02724634.2013.789039. ^ Millien, Virginie (May 2008). "The largest among the smallest: the body mass of the giant rodent Josephoartigasia monesi". Proceedings of the Royal Society B. 275 (1646): 1953–5, discussion 1957–8. doi:10.1098/rspb.2008.0087. PMC 2596365. PMID 18495621. Lay summary. ^ Bond, M.; Tejedor, M. F.; Campbell, K. E.; Chornogubsky, L.; Novo, N.; Goin, F. (2015-02-04). "Eocene primates of South America and the African origins of New World monkeys". Nature. 520 (7548): 538–541. Bibcode:2015Natur.520..538B. doi:10.1038/nature14120. ^ Wade, L. (2016-04-20). "Monkey ancestors rafted across the sea to North America". Science. doi:10.1126/science.aaf4154. ^ Bloch, J. I.; Woodruff, E. D.; Wood, A. R.; Rincon, A. F.; Harrington, A. R.; Morgan, G. S.; Foster, D. A.; Montes, C.; Jaramillo, C. A.; Jud, N. A.; Jones, D. S.; MacFadden, B. J. (2016-04-20). "First North American fossil monkey and early Miocene tropical biotic interchange". Nature. 533 (7602): 243–246. Bibcode:2016Natur.533..243B. doi:10.1038/nature17415. PMID 27096364. ^ a b Chaimanee, Y.; Chavasseau, O.; Beard, K. C.; Kyaw, A. A.; Soe, A. N.; Sein, C.; Lazzari, V.; Marivaux, L.; Marandat, B.; Swe, M.; Rugbumrung, M.; Lwin, T.; Valentin, X.; Zin-Maung-Maung-Thein; Jaeger, J. -J. (2012). "Late Middle Eocene primate from Myanmar and the initial anthropoid colonization of Africa". Proceedings of the National Academy of Sciences. 109 (26): 10293–10297. Bibcode:2012PNAS..10910293C. doi:10.1073/pnas.1200644109. PMC 3387043. PMID 22665790. ^ a b c d e f g h Lim, B. K. (July 2009). "Review of the Origins and Biogeography of Bats in South America". Chiroptera Neotropical. Departamento de Zoologia – Universidade de Brasília. 15 (1): 391–410. Retrieved 2018-01-24. ^ a b c d e f g Gunnell, G. F.; Simmons, N. B.; Seiffert, E. R. (2014-02-04). "New Myzopodidae (Chiroptera) from the Late Paleogene of Egypt: Emended Family Diagnosis and Biogeographic Origins of Noctilionoidea". PLoS ONE. 9 (2): e86712. Bibcode:2014PLoSO...986712G. doi:10.1371/journal.pone.0086712. PMC 3913578. PMID 24504061. ^ a b Teeling, E. C.; Springer, M.; Madsen, O.; Bates, P.; O'Brien, S.; Murphy, W. (2005-01-28). "A Molecular Phylogeny for Bats Illuminates Biogeography and the Fossil Record". Science. 307 (5709): 580–584. Bibcode:2005Sci...307..580T. doi:10.1126/science.1105113. PMID 15681385. ^ a b Le, M.; Raxworthy, C. J.; McCord, W. P.; Mertz, L. (2006-05-05). "A molecular phylogeny of tortoises (Testudines: Testudinidae) based on mitochondrial and nuclear genes" (PDF). Molecular Phylogenetics and Evolution. 40 (2): 517–531. doi:10.1016/j.ympev.2006.03.003. PMID 16678445. Retrieved 2012-04-12. ^ Williams, E. E.; Anthony, H. E.; Goodwin, G. G. (1952). "A new fossil tortoise from Mona Island, West Indies, and a tentative arrangement of the tortoises of the world". Bulletin of the American Museum of Natural History. American Museum of Natural History. 99 (9): 541–560. Retrieved 2015-10-28. ^ Gamble, T.; Bauer, A. M.; Colli, G. R.; Greenbaum, E.; Jackman, T. R.; Vitt, L. J.; Simons, A. M. (2010-12-03). "Coming to America: Multiple origins of New World geckos" (PDF). Journal of Evolutionary Biology. 24 (2): 231–244. doi:10.1111/j.1420-9101.2010.02184.x. PMC 3075428. PMID 21126276. ^ Carranza, S.; Arnold, N. E. (2003-08-05). "Investigating the origin of transoceanic distributions: mtDNA shows Mabuya lizards (Reptilia, Scincidae) crossed the Atlantic twice". Systematics and Biodiversity. 1 (2): 275–282. doi:10.1017/S1477200003001099. ^ Vidal, N.; Azvolinsky, A.; Cruaud, C.; Hedges, S. B. (2007-12-11). "Origin of tropical American burrowing reptiles by transatlantic rafting". Biology Letters. 4 (1): 115–118. doi:10.1098/rsbl.2007.0531. PMC 2412945. PMID 18077239. ^ Vidal, N.; Marin, J.; Morini, M.; Donnellan, S.; Branch, W. R.; Thomas, R.; Vences, M.; Wynn, A.; Cruaud, C.; Hedges, S. B. (2010-03-31). "Blindsnake evolutionary tree reveals long history on Gondwana". Biology Letters. 6 (4): 558–561. doi:10.1098/rsbl.2010.0220. PMC 2936224. PMID 20356885. ^ Mayr, G.; Alvarenga, H.; Mourer-Chauviré, C. C. (2011-10-01). "Out of Africa: Fossils shed light on the origin of the hoatzin, an iconic Neotropic bird". Naturwissenschaften. 98 (11): 961–966. Bibcode:2011NW.....98..961M. doi:10.1007/s00114-011-0849-1. PMID 21964974. ^ Woodburne, M. O. (2010-07-14). "The Great American Biotic Interchange: Dispersals, Tectonics, Climate, Sea Level and Holding Pens". Journal of Mammalian Evolution. 17 (4): 245–264. doi:10.1007/s10914-010-9144-8. PMC 2987556. PMID 21125025. ^ Koepfli, K.-P.; Gompper, M. E.; Eizirik, E.; Ho, C.-C.; Linden, L.; Maldonado, J.; Wayne, E. R. K. (2007). "Phylogeny of the Procyonidae (Mammalia: Carnivora): Molecules, morphology and the Great American Interchange". Molecular Phylogenetics and Evolution. 43 (3): 1076–1095. CiteSeerX 10.1.1.495.2618. doi:10.1016/j.ympev.2006.10.003. PMID 17174109. ^ a b Webb, S. D. (1976). "Mammalian Faunal Dynamics of the Great American Interchange". Paleobiology. 2 (3): 220–234. doi:10.1017/S0094837300004802. JSTOR 2400220. ^ a b Marshall, L. G.; Butler, R. F.; Drake, R. E.; Curtis, G. H.; Tedford, R. H. (1979-04-20). "Calibration of the Great American Interchange". Science. 204 (4390): 272–279. Bibcode:1979Sci...204..272M. doi:10.1126/science.204.4390.272. PMID 17800342. ^ Engel, S. R.; Hogan, K. M.; Taylor, J. F.; Davis, S. K. (1998). "Molecular Systematics and Paleobiogeography of the South American Sigmodontine Rodents". Molecular Biology and Evolution. 15 (1): 35–49. doi:10.1093/oxfordjournals.molbev.a025845. PMID 9491603. ^ Smith, M. F.; Patton, J. L. (1999). "Phylogenetic Relationships and the Radiation of Sigmodontine Rodents in South America: Evidence from Cytochrome b". Journal of Mammalian Evolution. 6 (2): 89–128. doi:10.1023/A:1020668004578. ^ Parada, A.; Pardiñas, U. F. J.; Salazar-Bravo, J.; D'Elía, G.; Palma, R. E. (March 2013). "Dating an impressive Neotropical radiation: Molecular time estimates for the Sigmodontinae (Rodentia) provide insights into its historical biogeography". Molecular Phylogenetics and Evolution. 66 (3): 960–968. doi:10.1016/j.ympev.2012.12.001. PMID 23257216. ^ a b Campbell, K. E.; Frailey, C. D.; Romero-Pittman, L. (2000). "The Late Miocene Gomphothere Amahuacatherium peruvium (Proboscidea: Gomphotheriidae) from Amazonian Peru: Implications for the Great American Faunal Interchange-[Boletín D 23]". Ingemmet. ^ a b Campbell, K. E.; Frailey, C. D.; Romero-Pittman, L. (April 2009). "In defense of Amahuacatherium (Proboscidea: Gomphotheriidae)". Neues Jahrbuch für Geologie und Paläontologie, Abhandlungen. 252 (1): 113–128. doi:10.1127/0077-7749/2009/0252-0113. ^ Prado, J. L.; Alberdi, M. T.; Azanza, B.; Sánchez, B.; Frassinetti, D. (2005). "The Pleistocene Gomphotheriidae (Proboscidea) from South America". Quaternary International. 126–128: 21–30. Bibcode:2005QuInt.126...21P. doi:10.1016/j.quaint.2004.04.012. ^ a b c Frailey, C. D.; Campbell, K. E. (September 2012). "Two New Genera of Peccaries (Mammalia, Artiodactyla, Tayassuidae) from Upper Miocene Deposits of the Amazon Basin". Journal of Paleontology. 86 (5): 852–877. doi:10.1666/12-012.1. ^ a b Prothero, D. R.; Campbell, K. E.; Beatty, B. L.; Frailey, C. D. (May 2014). "New late Miocene dromomerycine artiodactyl from the Amazon Basin: Implications for interchange dynamics". Journal of Paleontology. 88 (3): 434–443. doi:10.1666/13-022. ^ McFadden, B.; Labs-Hochstein, J.; Hulbert, Jr., R.C. ; Baskin, J.A. (2007). "Revised age of the late Neogene terror bird (Titanis) in North America during the Great American Interchange". Geology. 35 (2): 123–126. Bibcode:2007Geo....35..123M. doi:10.1130/G23186A.1. ^ a b c d e Webb, S. David (23 August 2006). "The Great American Biotic Interchange: Patterns and Processes". Annals of the Missouri Botanical Garden. 93 (2): 245–257. doi:10.3417/0026-6493(2006)93[245:TGABIP]2.0.CO;2. ^ Marshall, L. G.; Cifelli, R. L. (1990). "Analysis of changing diversity patterns in Cenozoic land mammal age faunas, South America". Palaeovertebrata. 19: 169–210. Retrieved 2018-10-08. ^ a b Webb, S. D. (1991). "Ecogeography and the Great American Interchange". Paleobiology. 17 (3): 266–280. doi:10.1017/S0094837300010605. JSTOR 2400869. ^ "Chalicotheriidae". www.amnh.org. AMNH. Retrieved 2018-10-08. ^ Gaudioso, P. J.; Gasparini, G. M.; Herbst, R.; Barquez, R. M. (2017). "First record of the Neolicaphrium recens Frenguelli, 1921 (Mammalia, Litopterna) in the Pleistocene of Santiago del Estero Province, Argentina". Papéis Avulsos de Zoologia. 57 (31): 23–29. doi:10.11606/0031-1049.2017.57.03. ^ a b c Simpson, George Gaylord (July 1950). "History of the Fauna of Latin America". American Scientist. 38 (3): 361–389. JSTOR 27826322. Retrieved 2013-02-14. ^ Argot, C. (2004). "Evolution of South American mammalian predators (Borhyaenoidea): anatomical and palaeobiological implications". Zoological Journal of the Linnean Society. 140 (4): 487–521. doi:10.1111/j.1096-3642.2004.00110.x. ^ Wang, X.; Tedford, R. H. (2010). Dogs: Their Fossil Relatives and Evolutionary History. Columbia University Press. pp. 19, 134. ISBN 978-0-231-13529-0. OCLC 185095648. Retrieved 19 June 2013. ^ Hodge, A.-M. (2011-03-31). "Updated Range of Immensity for Arctotherium: New Record for Largest Known Bear". Nature blogs. Retrieved 2011-06-01. ^ Soibelzon, L. H.; Schubert, B. W. (2011). "The Largest Known Bear, Arctotherium angustidens, from the Early Pleistocene Pampean Region of Argentina: With a Discussion of Size and Diet Trends in Bears". Journal of Paleontology. 85 (1): 69–75. doi:10.1666/10-037.1. ^ a b c Cione, A. L.; Tonni, E. P.; Soibelzon, L. (2003). "The Broken Zig-Zag: Late Cenozoic large mammal and tortoise extinction in South America" (PDF). Rev. Mus. Argentino Cienc. Nat., N.s. 5 (1): 1–19. doi:10.22179/REVMACN.5.26. Archived from the original (PDF) on 2011-07-06. Retrieved 2011-02-06. ^ a b c Martin, P. S. (2005). Twilight of the Mammoths: Ice Age Extinctions and the Rewilding of America. University of California Press. ISBN 978-0-520-23141-2. OCLC 58055404. ^ McDonald, H. G.; Harington, C. R.; De Iuliis, G. (September 2000). "The Ground Sloth Megalonyx from Pleistocene Deposits of the Old Crow Basin, Yukon, Canada" (PDF). Arctic. 53 (3): 213–220. doi:10.14430/arctic852. Retrieved 2008-08-16. ^ Stock, C. (1942-05-29). "A ground sloth in Alaska". Science. 95 (2474): 552–553. Bibcode:1942Sci....95..552S. doi:10.1126/science.95.2474.552. PMID 17790868. ^ a b c Prevosti, F. J. (2010-09-07). "Phylogeny of the large extinct South American Canids (Mammalia, Carnivora, Canidae) using a "total evidence" approach". Cladistics. 26 (5): 456–481. doi:10.1111/j.1096-0031.2009.00298.x. ^ a b Perini, F. A.; Russo, C. A. M.; Schrago, C. G. (2009-11-26). "The evolution of South American endemic canids: a history of rapid diversification and morphological parallelism". Journal of Evolutionary Biology. 23 (2): 311–322. doi:10.1111/j.1420-9101.2009.01901.x. PMID 20002250. ^ a b Slater, G. J.; Thalmann, O.; Leonard, J. A.; Schweizer, R. M.; Koepfli, K.-P.; Pollinger, J. P.; Rawlence, N. J.; Austin, J. J.; et al. (2009-11-03). "Evolutionary history of the Falklands wolf". Current Biology. 19 (20): R937–R938. doi:10.1016/j.cub.2009.09.018. PMID 19889366. ^ Lessios, H.A. (December 2008). "The Great American Schism: Divergence of Marine Organisms After the Rise of the Central American Isthmus". Annual Review of Ecology, Evolution, and Systematics. 39: 63–91. doi:10.1146/annurev.ecolsys.38.091206.095815. ^ Jain, S.; Collins, L. S. (2007-04-30). "Trends in Caribbean Paleoproductivity related to the Neogene closure of the Central American Seaway". Marine Micropaleontology. 63 (1–2): 57–74. Bibcode:2007MarMP..63...57J. doi:10.1016/j.marmicro.2006.11.003. ^ Amson, E.; Argot, C.; McDonald, H. G.; de Muizon, C. (2015). "Osteology and functional morphology of the axial postcranium of the marine sloth Thalassocnus (Mammalia, Tardigrada) with paleobiological implications". Journal of Mammalian Evolution. 22 (4): 473–518. doi:10.1007/s10914-014-9280-7. ^ Gould, Stephen Jay (1980). The Panda's Thumb. W. W. Norton & Company. pp. 352 (see pp. 294–5). ISBN 978-0-393-01380-1. OCLC 6331415. ^ Wilson, Edward O. (1999). The Diversity of Life. W. W. Norton & Company. pp. 432 (see p. 130). ISBN 978-0-393-31940-8. OCLC 25508994. ^ a b Jerison, Harry J. (1973). Evolution of the Brain and Intelligence. New York and London: Academic Press. pp. (see pp. 320–339). ISBN 978-0-12-385250-2. OCLC 700636. ^ a b Radinsky, L. (1981). "Brain Evolution in Extinct South American Ungulates". Brain, Behavior and Evolution. 18 (4): 169–187. doi:10.1159/000121785. PMID 7284752. ^ a b Jerison, Harry J. (2007). "What Fossils Tell Us about the Evolution of the Neocortex" (PDF). In Kaas, J. H. Evolution of Nervous Systems, Vol. 3. 3. New York and Oxford: Elsevier. pp. 1–12. doi:10.1016/B0-12-370878-8/00065-3. ISBN 978-0-12-392560-2. ^ Wroe, S.; Myers, T.; Seebacher, F; Kear, B.; Gillespie, A.; Crowther, M.; Salisbury, S. (2003). "An alternative method for predicting body mass: the case of the Pleistocene marsupial lion". Paleobiology. 29 (3): 403–411. doi:10.1666/0094-8373(2003)029<0403:AAMFPB>2.0.CO;2. ^ Quiroga, J. C.; Dozo, M. T. (1988). "The brain of Thylacosmilus atrox. Extinct South American saber-tooth carnivore marsupial". J. Hirnforschung. 29 (5): 573–586. PMID 3216103. ^ a b Radinsky, L. (1975). "Evolution of the Felid Brain". Brain, Behavior and Evolution. 11 (3–4): 214–254 (see p. 242). doi:10.1159/000123635. ^ Jerison, Harry J. (1973). Evolution of the Brain and Intelligence. New York and London: Academic Press. pp. (see p. 359). ISBN 978-0-12-385250-2. OCLC 700636. ^ Elgar, M. A.; Harvey, P. H. (1987). "Basal Metabolic Rates in Mammals: Allometry, Phylogeny and Ecology". Functional Ecology. 1 (1): 25–36. doi:10.2307/2389354. JSTOR 2389354. ^ Lovegrove, B. G. (August 2000). "The Zoogeography of Mammalian Basal Metabolic Rate". The American Naturalist. 156 (2): 201–219, see 214–215. doi:10.1086/303383. JSTOR 3079219. PMID 10856202. ^ McNab, Brian K. (November 1980). "Energetics and the limits to the temperate distribution in armadillos". Journal of Mammalogy. 61 (4): 606–627, see p. 618. doi:10.2307/1380307. JSTOR 1380307. ^ Agenbroad, L. D. (2004-06-26). "North American Proboscideans: Mammoths: The state of Knowledge, 2003". Quaternary International. 126–128: 73–92. Bibcode:2005QuInt.126...73A. doi:10.1016/j.quaint.2004.04.016. ^ Graham, R. W. (2001). "Late Quaternary Biogeography and Extinction of Proboscideans in North America" (PDF). In Cavarretta, G.; Gioia, P.; Mussi, M.; et al. The World of Elephants (La Terra degli Elefanti) – Proceedings of the 1st International Congress (Atti del 1 Congrsso Internazionale), Rome October 16–20, 2001. Rome: Consiglio Nazionale delle Ricerche. pp. 707–709. ISBN 978-88-8080-025-5. ^ a b Prado, J. L.; Alberdi, M. T.; Azanza, B.; Sánchez, B.; Frassinetti, D. (2005). "The Pleistocene Gomphotheriidae (Proboscidea) from South America". Quaternary International. 126–128: 21–30. Bibcode:2005QuInt.126...21P. doi:10.1016/j.quaint.2004.04.012. ^ Martin, Paul S. (1973). "The Discovery of America: The first Americans may have swept the Western Hemisphere and decimated its fauna within 1000 years" (PDF). Science. 179 (4077): 969–974. Bibcode:1973Sci...179..969M. doi:10.1126/science.179.4077.969. PMID 17842155. ^ Grayson, D. K.; Meltzer, D. J. (2003). "A requiem for North American overkill". Journal of Archaeological Science. 30 (5): 585–593. doi:10.1016/S0305-4403(02)00205-4. ^ Fiedel, S.; Haynes, G. (January 2004). "A premature burial: comments on Grayson and Meltzer's "Requiem for overkill"". Journal of Archaeological Science. 31 (1): 121–131. doi:10.1016/j.jas.2003.06.004. ^ Grayson, D. K.; Meltzer, D. J. (2004). "North American overkill continued?" (PDF). Journal of Archaeological Science. 31 (1): 133–136. doi:10.1016/j.jas.2003.09.001. Retrieved 2009-06-12. ^ Haynes, G. (July 2007). "A review of some attacks on the overkill hypothesis, with special attention to misrepresentations and doubletalk". Quaternary International. 169–170: 84–94. Bibcode:2007QuInt.169...84H. doi:10.1016/j.quaint.2006.07.002. ^ Burney, D. A.; Flannery, T. F. (July 2005). "Fifty millennia of catastrophic extinctions after human contact" (PDF). Trends in Ecology & Evolution. 20 (7): 395–401. doi:10.1016/j.tree.2005.04.022. PMID 16701402. Archived from the original (PDF) on 2014-05-25. Retrieved 2014-11-11. ^ Johnson, C. N.; Alroy, J.; Beeton, N. J.; Bird, M. I.; Brook, B. W.; Cooper, A.; Gillespie, R.; Herrando-Pérez, S.; Jacobs, Z.; Miller, G. H.; Prideaux, G. J.; Roberts, R. G.; Rodríguez-Rey, M.; Saltré, F.; Turney, C. S. M.; Bradshaw, C. J. A. (10 February 2016). "What caused extinction of the Pleistocene megafauna of Sahul?". Proceedings of the Royal Society B: Biological Sciences. 283 (1824): 20152399. doi:10.1098/rspb.2015.2399. PMC 4760161. PMID 26865301. ^ Burney, D. A.; Burney, L. P.; Godfrey, L. R.; Jungers, W. L.; Goodman, S. M.; Wright, H. T.; Jull, A. J. T. (July 2004). "A chronology for late prehistoric Madagascar". Journal of Human Evolution. 47 (1–2): 25–63. doi:10.1016/j.jhevol.2004.05.005. PMID 15288523. ^ Simmons, A. H. (1999). Faunal extinction in an island society: pygmy hippopotamus hunters of Cyprus. Interdisciplinary Contributions to Archaeology. Kluwer Academic/Plenum Publishers. pp. 229–230. doi:10.1007/b109876. ISBN 978-0-306-46088-3. OCLC 41712246. ^ Turney, C. S. M.; Flannery, T. F.; Roberts, R. G. (2008-08-21). "Late-surviving megafauna in Tasmania, Australia, implicate human involvement in their extinction". Proceedings of the National Academy of Sciences. 105 (34): 12150–12153. Bibcode:2008PNAS..10512150T. doi:10.1073/pnas.0801360105. PMC 2527880. PMID 18719103. ^ Harrison, T. (2011). "Tortoises (Chelonii, Testudinidae)". Paleontology and Geology of Laetoli: Human Evolution in Context, Vol. 2: Fossil Hominins and the Associated Fauna. Vertebrate Paleobiology and Paleoanthropology. Springer Science+Business Media. pp. 479–503. doi:10.1007/978-90-481-9962-4_17. ISBN 978-90-481-9961-7. ^ Hansen, D. M.; Donlan, C. J.; Griffiths, C. J.; Campbell, K. J. (April 2010). "Ecological history and latent conservation potential: large and giant tortoises as a model for taxon substitutions". Ecography. 33 (2): 272–284. doi:10.1111/j.1600-0587.2010.06305.x. ^ Steadman, D. W.; Martin, P. S.; MacPhee, R. D. E.; Jull, A. J. T.; McDonald, H. G.; Woods, C. A.; Iturralde-Vinent, M.; Hodgins, G. W. L. (2005-08-16). "Asynchronous extinction of late Quaternary sloths on continents and islands". Proceedings of the National Academy of Sciences. 102 (33): 11763–11768. Bibcode:2005PNAS..10211763S. doi:10.1073/pnas.0502777102. PMC 1187974. PMID 16085711. ^ Anderson, Paul K. (1995). "Competition, Predation, and the Evolution and Extinction of Steller's Sea Cow, Hydrodamalis gigas". Marine Mammal Science. 11 (3): 391–394. doi:10.1111/j.1748-7692.1995.tb00294.x. ^ Vartanyan, S. L.; Garutt, V. E.; Sher, A. V. (1993). "Holocene dwarf mammoths from Wrangel Island in the Siberian Arctic". Nature. 362 (6418): 337–349. Bibcode:1993Natur.362..337V. doi:10.1038/362337a0. ^ Guthrie, R. Dale (2004). "Radiocarbon evidence of mid-Holocene mammoths stranded on an Alaskan Bering Sea island". Nature. 429 (6993): 746–749. Bibcode:2004Natur.429..746D. doi:10.1038/nature02612. PMID 15201907. ^ Martin, P. S.; Steadman, D. W. (1999-06-30). "Prehistoric extinctions on islands and continents". In MacPhee, R. D. E. Extinctions in near time: causes, contexts and consequences. Advances in Vertebrate Paleobiology. 2. New York: Kluwer/Plenum. pp. 17–56, see p. 38. ISBN 978-0-306-46092-0. OCLC 41368299. Retrieved 2015-11-07. ^ a b c Vanzolini, P. E.; Heyer, W. R. (1985). "The American Herpetofauna and the Interchange" (PDF). In Stehli, F. G.; Webb, S. D. The Great American Biotic Interchange. Topics in Geobiology, vol. 4. Plenum Press. pp. 475–487. ISBN 978-0-306-42021-4. ^ Pauly, G. B; Hillis, D. M.; Cannatella, D. C. (November 2004). "The history of a Nearctic colonization: Molecular phylogenetics and biogeography of the Nearctic toads (Bufo)". Evolution. 58 (11): 2517–2535. doi:10.1111/j.0014-3820.2004.tb00881.x. ^ Faivovich, J.; Haddad, C. F. B.; Garcia, P. C. A.; Frost, D. R.; Campbell, J. A.; Wheeler, W. C. (2005-06-24). "Systematic review of the frog family Hylidae, with special reference to Hylinae: phylogenetic analysis and taxonomic revision" (PDF). Bulletin of the American Museum of Natural History. 294: 240 pages, see pp. 125–128. CiteSeerX 10.1.1.470.2967. doi:10.1206/0003-0090(2005)294[0001:srotff]2.0.co;2. Archived from the original (PDF) on 2011-07-26. Retrieved 2010-03-07. ^ Heinicke, M. P.; Duellman, W. E.; Hedges, S. B. (2007-06-04). "Major Caribbean and Central American frog faunas originated by ancient oceanic dispersal". Proc. Natl. Acad. Sci. 104 (24): 10092–10097. Bibcode:2007PNAS..10410092H. doi:10.1073/pnas.0611051104. PMC 1891260. PMID 17548823. ^ a b Castaneda, O. C.; Miller, W. (July 2004). "Late Tertiary Terrestrial Mammals from Central Mexico and Their Relationship to South American Immigrants" (PDF). Revista Brasileira de Paleontologia. 7 (2): 249–261. doi:10.4072/rbp.2004.2.19. Retrieved 2009-01-29. ^ Arroyo-Cabrales, Joaquín; Polaco, Oscar J.; Johnson, Eileen; Ferrusquía-Villafranca, Ismael (2010-02-01). "A perspective on mammal biodiversity and zoogeography in the Late Pleistocene of México". Quaternary International. 212 (2): 187–197. Bibcode:2010QuInt.212..187A. doi:10.1016/j.quaint.2009.05.012. ^ Lundelius, E. L.; Bryant, V. M.; Mandel, R.; Thies, K. J.; Thoms, A. (January 2013). "The first occurrence of a toxodont (Mammalia, Notoungulata) in the United States". Journal of Vertebrate Paleontology. 33 (1): 229–232. doi:10.1080/02724634.2012.711405. ISSN 0272-4634. ^ Culver, M.; Johnson, W. E.; Pecon-Slattery, J.; O'Brien, S. J. (2000). "Genomic Ancestry of the American Puma (Puma concolor)" (PDF). Journal of Heredity. 91 (3): 186–197. doi:10.1093/jhered/91.3.186. PMID 10833043. ^ a b c d e f g h i j Weir, J. T.; Bermingham, E.; Schluter, D. (2009-12-22). "The Great American Biotic Interchange in birds". Proceedings of the National Academy of Sciences. 106 (51): 21737–21742. Bibcode:2009PNAS..10621737W. doi:10.1073/pnas.0903811106. ISSN 0027-8424. PMC 2799814. PMID 19996168. ^ Ricklefs, R. E. (2002). "Splendid isolation: historical ecology of the South American passerine fauna". Journal of Avian Biology. 33 (3): 207–211. doi:10.1034/j.1600-048X.2002.330301.x. ^ a b c Feller, A. E.; Hedges, S. B. (June 1998). "Molecular Evidence for the Early History of Living Amphibians". Molecular Phylogenetics and Evolution. 9 (3): 509–516. doi:10.1006/mpev.1998.0500. PMID 9667999. ^ Santos, J. C.; Coloma, L. A.; Summers, K.; Caldwell, J. P.; Ree, R.; Cannatella, D. C. (March 2009). "Amazonian Amphibian Diversity is Primarily Derived from Late Miocene Andean Lineages". PLoS Biology. 7 (3): 448–461 (see pp. 452, 454–455). doi:10.1371/journal.pbio.1000056. PMC 2653552. PMID 19278298. ^ Taplin, L. E.; Grigg, G. C. (1989). "Historical Zoogeography of the Eusuchian Crocodilians: A Physiological Perspective". American Zoologist. 29 (3): 885–901. doi:10.1093/icb/29.3.885. ^ Shaw, C. A.; McDonald, H. G. (1987-04-10). "First Record of Giant Anteater (Xenarthra, Myrmecophagidae) in North America". Science. 236 (4798): 186–188. Bibcode:1987Sci...236..186S. doi:10.1126/science.236.4798.186. JSTOR 1698387. PMID 17789783. ^ Ford, S. (2006). "The Biogeographic History of Mesoamerican Primates". In Estrada, A.; Garber, P.A. ; Pavelka, M.S.M. ; Luecke, L. New Perspectives in the Study of Mesoamerican Primates. Developments in Primatology: Progress and Prospects. New York: Springer. pp. 81–114. doi:10.1007/0-387-25872-8_4. ISBN 978-0-387-25854-6. ^ Pereira, S. L.; Baker, A. J. (2004). "Vicariant Speciation of Curassows (Aves, Cracidae): A Hypothesis Based On Mitochondrial DNA Phylogeny". The Auk. 121 (3): 682–694. doi:10.1642/0004-8038(2004)121[0682:VSOCAC]2.0.CO;2. ^ Irestedt, Martin; Fjeldså, Jon; Johansson, Ulf S.; Ericson, Per G.P. (2002). "Systematic relationships and biogeography of the tracheophone suboscines (Aves: Passeriformes)". Molecular Phylogenetics and Evolution. 23 (3): 499–512. doi:10.1016/S1055-7903(02)00034-9. PMID 12099801. ^ Savage, J. M.; Wake, M. H.; Price, A. (2001). "Reevaluation of the Status of Taxa of Central American Caecilians (Amphibia: Gymnophiona), with Comments on Their Origin and Evolution". Copeia. 2001 (1): 52–64. doi:10.1643/0045-8511(2001)001[0052:ROTSOT]2.0.CO;2. ^ a b Elmer, K. R.; Bonett, R. M.; Wake, D. B.; Lougheed, S. C. (2013-03-04). "Early Miocene origin and cryptic diversification of South American salamanders". BMC Evolutionary Biology. 13 (1): 59. doi:10.1186/1471-2148-13-59. PMC 3602097. PMID 23497060. ^ Parra-Olea, G.; Garcia-Paris, M.; Wake, D. B. (2004). "Molecular diversification of salamanders of the tropical American genus Bolitoglossa (Caudata: Plethodontidae) and its evolutionary and biogeographical implications". Biological Journal of the Linnean Society. 81 (3): 325–346. doi:10.1111/j.1095-8312.2003.00303.x. Retrieved 2008-01-11. ^ Le, Minh; McCord, William P. (2008-07-25). "Phylogenetic relationships and biogeographical history of the genus Rhinoclemmys Fitzinger, 1835 and the monophyly of the turtle family Geoemydidae (Testudines: Testudinoidea)". Zoological Journal of the Linnean Society. 153 (4): 751–767. doi:10.1111/j.1096-3642.2008.00413.x. ^ Slowinski, J. B.; Keogh, J. S. (April 2000). "Phylogenetic Relationships of Elapid Snakes Based on Cytochrome b mtDNA Sequences". Molecular Phylogenetics and Evolution. 15 (1): 157–164. doi:10.1006/mpev.1999.0725. PMID 10764543. ^ Slowinski, J. B.; Boundy, J.; Lawson, R. (June 2001). "The Phylogenetic Relationships of Asian Coral Snakes (Elapidae: Calliophis and Maticora) Based on Morphological and Molecular Characters". Herpetologica. 57 (2): 233–245. JSTOR 3893186. ^ Place, A. J.; Abramson, C. I. (2004). "A Quantitative Analysis of the Ancestral Area of Rattlesnakes". Journal of Herpetology. 38 (1): 152–156. doi:10.1670/103-03N. ^ Parkinson, C. L. (1999). "Molecular Systematics and Biogeographical History of Pit Vipers as Determined by Mitochondrial Ribosomal DNA Sequences". Copeia. 3 (3): 576–586. doi:10.2307/1447591. JSTOR 1447591. ^ a b Weinstock, J.; et al. (2005). "Evolution, systematics, and phylogeography of Pleistocene horses in the New World: a molecular perspective". PLoS Biology. 3 (8): e241. doi:10.1371/journal.pbio.0030241. PMC 1159165. PMID 15974804. ^ a b c d Orlando, L.; Male, D.; Alberdi, M. T.; Prado, J. L.; Prieto, A.; Cooper, A.; Hänni, C. (2008). "Ancient DNA Clarifies the Evolutionary History of American Late Pleistocene Equids". Journal of Molecular Evolution. 66 (5): 533–538. Bibcode:2008JMolE..66..533O. doi:10.1007/s00239-008-9100-x. PMID 18398561. ^ Polaco, O. J.; Arroyo-Cabrales, J.; Corona-M., E.; López-Oliva, J. G. (2001). "The American Mastodon Mammut americanum in Mexico" (PDF). In Cavarretta, G.; Gioia, P.; Mussi, M.; et al. The World of Elephants – Proceedings of the 1st International Congress, Rome October 16–20, 2001. Rome: Consiglio Nazionale delle Ricerche. pp. 237–242. ISBN 978-88-8080-025-5. ^ Soibelzon, L. H.; Tonni, E. P.; Bond, M. (October 2005). 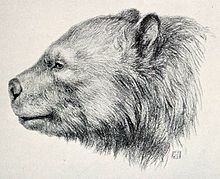 "The fossil record of South American short-faced bears (Ursidae, Tremarctinae)". Journal of South American Earth Sciences. 20 (1–2): 105–113. Bibcode:2005JSAES..20..105S. doi:10.1016/j.jsames.2005.07.005. ^ "Canis dirus (dire wolf)". Paleobiology Database. Retrieved 2013-01-27. ^ Hodnett, John-Paul M.; Mead, Jim I.; Baez, A. (2009). "Dire Wolf, Canis dirus (Mammalia; Carnivora; Canidae), from the Late Pleistocene (Rancholabrean) of East-Central Sonora, Mexico". The Southwestern Naturalist. 54 (1): 74–81. doi:10.1894/CLG-12.1. ^ Berta, A. (November 1988). Quaternary Evolution and Biogeography of the Large South American Canidae (Mammalia: Carnivora). University of California Publications in Geological Sciences. 132. University of California Press. ISBN 978-0-520-09960-9. Retrieved 2013-01-28. ^ "New Clues To Extinct Falklands Wolf Mystery". EurekAlert. Science Daily. 2009-11-03. Retrieved 2011-09-03. ^ Cooper, A.; Mena, F.; Austin, J. J.; Soubrier, J.; Prevosti, F.; Prates, L.; Trejo, V. (2013). "The origins of the enigmatic Falkland Islands wolf". Nature Communications. 4: 1552. Bibcode:2013NatCo...4E1552A. doi:10.1038/ncomms2570. PMID 23462995. ^ Mones, A.; Rinderknecht, A. (2004). "The First South American Homotheriini (Mammalia: Carnivora: Felidae)" (PDF). Comunicaciones Paleontologicas Museo Nacional de Historia Natural y Anthropologia. 2 (35): 201–212. Retrieved 2013-02-08. ^ Sanchez, Fabiola (2008-08-21). "Saber-toothed cat fossils discovered". Associated Press. Retrieved 2017-05-07. ^ Orozco, José (2008-08-22). "Sabertooth Cousin Found in Venezuela Tar Pit – A First". National Geographic News. National Geographic Society. Retrieved 2008-08-30. ^ a b Rincón, Ascanio D.; Prevosti, Francisco J.; Parra, Gilberto E. (2011). "New saber-toothed cat records (Felidae: Machairodontinae) for the Pleistocene of Venezuela, and the Great American Biotic Interchange". Journal of Vertebrate Paleontology. 31 (2): 468–478. doi:10.1080/02724634.2011.550366. ^ Manzuetti, A.; Perea, D.; Ubilla, M.; Rinderknecht, A. (2018). "First record of Smilodon fatalis Leidy, 1868 (Felidae, Machairodontinae) in the extra-Andean region of South America (late Pleistocene, Sopas Formation), Uruguay: Taxonomic and paleobiogeographic implications". Quaternary Science Reviews. 180: 57–62. Bibcode:2018QSRv..180....1M. doi:10.1016/j.quascirev.2017.11.024. ^ Kurtén, B.; Anderson, E. (1980). Pleistocene Mammals of North America. Columbia University Press. ISBN 978-0231037334. OCLC 759120597. ^ Chimento, N. R.; Agnolin, F. L. (2017). "The fossil American lion (Panthera atrox) in South America: Palaeobiogeographical implications". Comptes Rendus Palevol. 16 (8): 850–864. doi:10.1016/j.crpv.2017.06.009. ^ Ericson, P. G. P.; Christidis, L.; Cooper, A.; Irestedt, M.; Jackson, J.; Johansson, U. S.; Norman, J. A. (2002-02-07). "A Gondwanan origin of passerine birds supported by DNA sequences of the endemic New Zealand wrens". Proceedings of the Royal Society B: Biological Sciences. 269 (1488): 235–241. doi:10.1098/rspb.2001.1877. ISSN 0962-8452. PMC 1690883. PMID 11839192. ^ Dacosta, J. M.; Klicka, J. (2008-02-21). "The Great American Interchange in birds: a phylogenetic perspective with the genus Trogon". Molecular Ecology. 17 (5): 1328–1343. doi:10.1111/j.1365-294X.2007.03647.x. PMID 18302692. ^ Emslie, Steven D. (22 June 1988). "The Fossil History and Phylogenetic Relationships of Condors (Ciconiiformes: Vulturidae) in the New World". Journal of Vertebrate Paleontology. 8 (2): 212–228. doi:10.1080/02724634.1988.10011699. JSTOR 4523192. ^ a b Emslie, Steven D. (July 1988). "An early condor-like vulture from North America" (PDF). The Auk. 105: 529–535. ^ a b Stucchi, Marcelo; Emslie, Steven D. (February 2005). "A New Condor (Ciconiiformes, Vulturidae) From The Late Miocene/Early Pliocene Pisco Formation, Peru". The Condor. 107 (1): 107–113. doi:10.1650/7475. Cione, A. L.; Gasparini, G. M.; Soibelzon, E.; Soibelzon, L. H.; Tonni, E. P. (24 April 2015). The Great American Biotic Interchange: A South American Perspective. Springer. ISBN 978-94-017-9792-4. OCLC 908103326. Croft, D. A. (29 August 2016). Horned Armadillos and Rafting Monkeys: The Fascinating Fossil Mammals of South America. Indiana University Press. ISBN 978-0-253-02094-9. OCLC 964782185. Fariña, Richard A.; Vizcaíno, Sergio F.; De Iuliis, Gerry (22 May 2013). Megafauna: Giant Beasts of Pleistocene South America. Indiana University Press. ISBN 978-0-253-00719-3. OCLC 779244424. Simpson, George Gaylord (July 1950). "History of the Fauna of Latin America". American Scientist. 38 (3): 361–389. JSTOR 27826322. Retrieved 2013-02-14. Stehli, F. G.; Webb, S. D., eds. (2013). The Great American Biotic Interchange. Topics in Geobiology, vol. 4. 4. Springer Science & Business Media. doi:10.1007/978-1-4684-9181-4. ISBN 978-1-4684-9181-4. OCLC 968646442. Woodburne, M. O. (2010-07-14). "The Great American Biotic Interchange: Dispersals, Tectonics, Climate, Sea Level and Holding Pens". Journal of Mammalian Evolution. 17 (4): 245–264. doi:10.1007/s10914-010-9144-8. PMC 2987556. PMID 21125025. The biotic & geologic dynamics of the Great American Biotic Interchange are reviewed and revised.